The Mess Potential is Exponential: I was RUNNING! About a month ago I posted an update about my running progress on Twitter and my dear friend Tatiana told me that I should write a post about my training and how I went from minimal activity (I wasn't exactly a coach potato) to running a 15K in a few months. Well I love my friend for asking and for the support, so thank you. In college I began my longer distance running (I had kept up the 2-3 miles on my own) when I was lined up as a brown belt in my karate class and my instructor, now lifetime best girlfriend Joyce, asked "Does anyone want to run a half marathon with me?" I was also training for my black belt at the time and had a Cardio requirement (only 3 miles, I am an over achiever I guess) and I think that is what prompted me, the only one, to raise my hand and say "Sure, I'll run it." 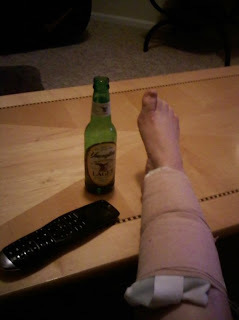 I learned a lot about knee pain and IT Band tendinitis and a host of other injuries that fall. But I ran my race in December and finished in a respectable 2 hours, 10 minutes! A few months later, in March 1999, I ran my first Gate River Run in Jacksonville (the nation's largest 15K (9.3 miles) race) and finished in 85 minutes. At the time I thought it was a slow pace. But 9:27 miles? I was so young and stupid then. It's a goal now to get back to that time! Many years later I picked up a new and wonderful running partner, my friend Vivien. 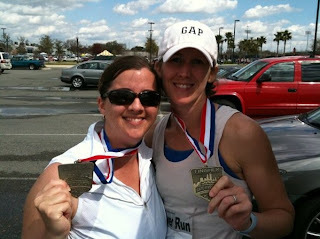 We ran 2-3 times a week together around the awesome University of Florida (GO GATORS!) campus and talked and talked and talked. I told her how fun the River Run was, the course is awesome, and we agreed to run it together some day. But then I got pregnant and we moved away, she graduated and moved to Denver, and it hasn't happened yet. But it will happen. I miss her and our great running conversations, and it's a goal of mine to race with her someday. Last year I ran the River Run and my goal was only to cross the finish line. Time didn't matter. I was in a horrible, dark mental place and I hated EVERY minute of my training. HATED IT. Going out to run was torture. I ran alone. But Joyce and Vivien kept me going, motivating me over the miles that separated us, to keep training and pushing through. We exchanged Facebook messages, reporting in on our training and they are the reason I managed to continue when I wanted to quit. Vivien even flew in from Denver, having survived her first freezing winter just to cheer me (and Joyce - the speedy fitness guru) on from the sidelines. How is that for awesomeness? After the race though I really backed off the running. I just wasn't in a good place. I didn't run again for about a month and then it was only sporadically for the rest of the year. At a BBQ in September I mentioned I wanted to run the River Run and needed to start running again. That is how I got my local training partner, Meredith. She had run the race twice before. years ago, and somehow I tricked her in to training with me this year!! We didn't start seriously training until January though (and she said she hoped I had forgotten about her promise to run me when I posted this in December) and she has quickly become one of my greatest friends here. Having a training partner, especially one who thinks so very similar to you, is the best. For me, it's kind of necessary now that I think about it. With a partner it's harder to bail on your workouts and it's much more fun when you're out there pounding the pavement. So in January, with a new (more positive) attitude towards life, and a new running partner, I started training. We ran a few times a week on our own and met up on the weekends for our long training runs. Each week was at least a Fartlek speed workout, a tempo run, maybe an easy base builder (just to get extra miles in) and then the long run. We also did some crazy (awesome) strength building exercises 2-3 days a week that her trainer Ali set up for her. As the weeks went by we watched our long run times go from an 11:50 per mile pace to 10:11. And I personally saw my short distance runs go from 10:30 on a 2 mile jog to today's 8:44 pace. I even took a photo of my watch the first time (in 10 years) I ran a 9:00 per mile pace for 2 miles because I couldn't believe it. The training this year is working and instead of hating EVERY minute of running, I only hate a few, usually when I'm reaching a threshold of pain I need to push through. I also joined The Daily Mile to record my training in a space other than the Excel file I've kept for 2 years with the date, distance, route, and pace for every run I did. The Daily Mile is awesome and I highly recommend it if you need a good exercise journal and place to collaborate on pretty much anything. A friend who I got to join said it is like Facebook and Twitter for runners. I completely agree. The day of the River Run this year was a little bit of a disappointment for me only because I didn't run as well as I wanted to. I suffered some pretty horrible shin splints two weeks before the race and they never really went away. The pain kicked in full mode at about mile 6 and the bridge just killed me. Normally on the bridge you make it to the top and cheer because gravity can carry you the final mile to the finish line. But for me the race down was worse than the way up due to the impact pain on my leg. But I finished. I finished 20 seconds under triple digits, which was my goal this year, under 100 minutes. I'm happy I did it and I cut a significant amount of time off my pace from last year. 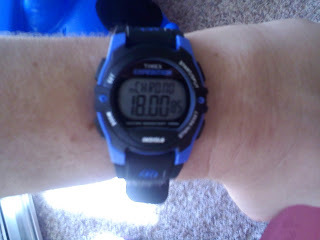 Now my goal is to get back to that 1999 pace of 9:27 per mile. It might take a little while, but it's going to happen. Maybe it'll be the year Vivien comes to run with Joyce, Meredith and I? I hope so! I miss you V! See my post race evening? Meredith ran a great race this year too! She battled a crappy arch cramp near the end that threw off her stride but she tamed the Green Monster bridge and finished in just a hair over 98 minutes. She's awesome and I am so happy she joined me for the run. I'm looking forward to many more races with her this year!! Thank you girl!! So I guess how I did it was just by getting more serious about training, finding a good running partner, and having the absolute BEST support group in the world. Thank you to my wonderful husband who never questioned my long weekend runs. He encouraged me to get out there and try again, listened to me prattle about my paces and distances, and watched me stretch and cry over injuries. And my girls, past and present running partners, you kept me sane, kept me moving, and made me feel loved too. I appreciate all of you! !